This page is the brochure for your selected program. You can view the information provided for this program on this page and click on the available buttons for additional options. Freiburg, located in southwestern Germany near the French and Swiss borders, is a university town noted for its pleasant climate and progressive environmental policies. Known for its impressive medieval architecture and surrounded by countryside, Freiburg is small enough to be walkable but large enough to offer all of the amenities and cultural opportunities of a moderately-sized city of 200,000. Its location on the edge of the Black Forest also provides for easy access to a range of outdoor activities throughout the year. Hobart and William Smith Colleges maintain an affiliation with IES Abroad (the Institute for the International Exchange of Students) to offer three program tracks in Freiburg, based at the IES Abroad Freiburg Center in collaboration with Albert-Ludwigs-Universität Freiburg. Students will have the opportunity to enroll in Environmental Studies and Sustainability, European Union, or German Language and Area Studies. All of the tracks provide integration into the local community and culture by accommodating students in a residence with other German and international students and giving them access to facilities, cultural activities, and academic coursework/opportunities at the University. Students in the Environmental Studies and Sustainability track will select from a variety of courses taught in English through IES or the Albert-Ludwigs-Universität Freiburg and will take a German language course at an appropriate level. See Environmental Studies and Sustainability courses here. Those in the European Union track will take an EU Studies Integrative Seminar (in English) and a German language course (at an appropriate level), along with electives (in English) from a variety of subject areas including history, international relations, political science, economics, and sociology. See European Union courses here. Students in German Language and Area Studies will take courses in German offered by local faculty through IES and may enroll in courses at the Albert-Ludwigs-Universität Freiburg or pursue an internship. See German Language and Area Studies courses here. With its multiple tracks, this program can accommodate students in a variety of subject areas and is designed for those who are interested in learning more about Germany and in developing German language skills. The German Language and Area Studies track is intended for more advanced language students who will also be able to take courses in a range of fields (through IES and the Albert-Ludwigs-Universität Freiburg). The Environmental Studies and Sustainability track is designed for students in Environmental Studies, while the European Union track is intended primarily for students in the social sciences; courses in these tracks are taught in English, with the exception of the required language course. This is a highly selective program and only those applying for and receiving a Julius G. Blocker ’53 Fellowship will be considered for admission. Blocker Fellows receive funding to offset a variety of program costs (see the Money Matters section below for further information and application materials). The program is open to juniors and seniors (sophomores may be considered in exceptional cases) in good academic and social standing with a minimum GPA of 3.0. Students enrolling in the Environmental Studies and Sustainability and European Union tracks must have completed at least one semester of college-level German prior to departure and must take a German language course in Freiburg. Those enrolling in the German Language and Area Studies track must have completed a minimum of 4 semesters of college-level German prior to departure with an average grade of B or better. Due to the challenging nature of study abroad, student academic and disciplinary records will be carefully screened. Important note: students who enroll in the German Language and Area Studies track need to be aware that there are two types of courses available on this track - IES Abroad courses and German university courses - and the two course types have different finish dates. Fall students who choose IES Abroad courses only will start the program at the end of August and will finish in mid-December. Fall students do not have the option of choosing German university courses because these courses do not finish until mid-February, so they would not be back in time to start the spring semester at HWS. Spring students in the German Language track will start the program in late February and will finish in late June if they choose only IES Abroad courses, while those who choose German university courses will finish in mid-July. Note that due to the German academic calendar, seniors who enroll in the German Language and Area Studies track in the spring semester would not be finished in time for graduation on the HWS campus. Students in the fall Environmental Studies or European Union tracks will start around the end of August and will finish in mid-December. Students in the spring European Union track will start in early January and finish in early May (those pursuing an optional internship will finish in late July). Students in the spring Environmental Studies track will start in late February and will finish in late June, although those pursuing a research assistantship will finish in early August. Students will reside in a student residence with German and international students arranged by IES Abroad. They will typically prepare their own meals in the shared kitchen at their residence or take meals in affordable student cafeterias. Students in the German Language and Area Studies track will participate in extended excursions to Berlin and Italy (Venice, Verona, and Padua) and day trips to the Black Forest, Swiss Alps, and the Alsace region along the French border. 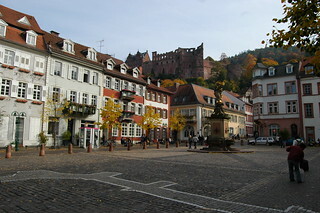 The Environmental Studies and Sustainability track includes extended excursions in the Black Forest, Swiss Alps, and Rhine River Valley, while those in the European Union track will have 3 extended excursions during which they will meet with EU representatives from member states as well as with business and NGO leaders. One excursion will include Berlin and Prague, a second will visit several cities in Western Europe (including Brussels and Paris), and the third will focus on a current event and will vary from semester to semester. Optional excursions may be offered by IES for an additional fee. Students will be charged standard HWS tuition and fees and a $600 administrative fee. This will cover tuition for a five-course semester, health insurance, program-related activities and excursions, and accommodations (accommodation costs are covered by the Julius G. Blocker '53 Endowed Fund - see below). Blocker Fellows receive a stipend intended to offset the cost of meals, airfare, books and course materials, local transportation, and residence permit. Additional expenses not covered include laundry, entertainment, and independent travel. It is difficult to give an accurate estimate of personal expenses because student spending habits differ considerably. We would suggest a minimum of $1500 for these additional expenses. However, students on a tight budget should be able to manage with less. If you are concerned about finances, we strongly encourage you to talk to the CGE staff who can offer information and advice based on your specific situation. Only those applying for and receiving a Julius G. Blocker ’53 Fellowship will be considered for admission. Further information about this funding opportunity is available HERE. You may complete the Blocker Fellowship application as part of your online study abroad application. The Blocker specific essay and additional Blocker faculty recommendation form must be received by the general application deadline posted in your account. HWS students must complete all components of the Global Education application in order to be considered for admission to this program. This program is offered every semester. All components of the application must be submitted online by the published deadline. Specific deadline dates are set each semester and typically will be in October (for Fall programs) and March (for Spring programs). IMPORTANT: The handbook(s) below is/are the most recent handbook(s) published for this program. A new version, with updated information, will be made available each semester. Program participants will receive their updated handbook approximately 2-3 months prior to their program’s start date. Please DO NOT MAKE TRAVEL ARRANGEMENTS until you have received final confirmation of the program start/finish dates for the specific semester you are attending. Dates included in versions of the program handbook intended for previous semesters do not necessarily apply to future programs. NOTE: The information above is subject to change. Please see the CGE for more information.